A minor problem now can become a major, and expensive, problem down the road. Foundation Cracks. Examine the foundation from the outside and inside, too, if accessible. Look for horizontal cracks or any cracks bigger than one-third of an inch, which could mean serious structural problems. If the yard slopes toward the house, look for signs of water damage in the basement. Bad or Strange Odors. Pay attention to smells in each room of the house, and even on the outside of the house. Cigarette smoke and pet odors can be difficult to hide. If a home smells heavily of cleaning products (especially bleach) or deodorizers, the seller may be trying to cover up a stinky situation. Mildew and Mold. Check for signs of mold on basement walls and in laundry rooms. White or green colonies of mold can also indicate excessive water in the crawl space or basement. This can mean that soil needs to be brought in around the foundation to keep the water sloping away from the house. Roof. Look for defective roofing and/or flashings, missing or falling shingles, curling shingles, flat spots in the roof that trap water, and low slope roofs that have shingles. Weak Water Pressure / Old Plumbing. Check the water pressure by running the bathroom sink and flushing the toilet at the same time. Low water flow may indicate plumbing problems, such as corroded pipes that need to be replaced. New pipes can run as high as $15,000 in a typical 1,500-square-foot home. Ceiling and Wall Stains. Water stains in a bathroom may indicate the shower or sink is leaking and needs to be re-caulked. It could also require ripping out tile and replacing the shower pan, which costs around $1,500 or having a plumber come in to repair the sink. Most roof leaks that come from the ceiling could be a result of neglected flashings that seals “valleys” in the roof or around a chimney or vents, which may cost up to $500. But roof leaks may also mean it is time to replace shingles, which could cost in the thousands of dollars. You may also want to take a look in the attic for broken trusses that could be causing leaks. Doors That Don’t Close. If more than one door won’t close or swings open by itself, it may indicate a structural issue, such as a foundation that has settled or framing that is deteriorating. Locked Doors. Inquire about any doors that are locked or marked “off limits” during your home tour. The homeowners may be trying to hide something. Old or Faulty Wiring. Ensure all the switches and outlets in the house function properly. Flickering lights, circuits that don’t work and hot outlets or faceplates are all symptoms of wiring problems. Electrical needs for today’s appliances and electronics may exceed the capacity of homes built as little as 10 years ago. You may end up spending $2,500 or more to have an electrician update the electrical system. Non-functioning Windows. Open and close all windows. Feel for irregular or large pockets of air drafts. Check for cracks and water in between double-paned windows. If you enter negotiations to buy a house in Mississauga area, it is wise to always put in a condition on having a professional inspect the home for minor and major problems. Even brand new houses can have problems that the builder has overlooked. A minor problem now can become a major, and expensive, problem down the road. Most of these problems can be repaired, but depending on the specific problem; the cost can be substantial, which makes it the deciding factor in whether you ultimately buy the house. House deck allows us to comfortably spend time outside, BBQ, relax, hang out with friends.. plus it’s definitely an asset when selling your home. Who doesn’t love a nice looking deck, especially if you have a rockin’ backyard to go wit it! You wanna get the most of it. Building a deck is a project and like any other you wanna try to do it on budget, on time and within the scope. 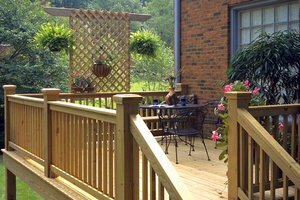 Here are some things to think about before embarking on the home deck building project. 1. Decide where you gonna build the deck and how big will it be. You wanna have it easily accessible from inside the house, and not be in way of the kitchen or create constant traffic in and out. Figure out how the sun will shine on your deck, will you have privacy from your neighbours, will it be easy to get on the deck, and will it be easy to access the rest of the backyard. 2. Decided on your budget and stick to that. Find out all the prices and try to select the best material for the money, keeping in mind durability and the ease of maintenance. Also think about who’s building the deck. You? or hiring someone? That can mean more or less money/time spent. Both have pros and cons. Of course, if you’re a skilled carpenter you might want to do it yourself. 3. Check out other decks in your neighbourhood and make sure that what you have in mind is not too far away from that. You don’t want to build something that sticks like a sore thumb. 4. Make sure you understand the local building code so your deck passes safety and the home inspection. 5. Lastly, you wanna think about how the deck is going to look compared to the rest of your house and how it fits in with your backyard.